The Palić lake covers an area of 380 hectares (940 acres), with a 17-kilometre (11 mi) shore line. The average depth of the lake is 2 metres (6 ft 7 in), and there are lots of fish in it. In 1995 the Tisa-Palić canal was opened so that the lake would remain as healthy as it was before in spite of development around the lake. Palić has a hot summer humid continental climate (Köppen climate classification: Dfa). ^ Popis stanovništva, domaćinstava i Stanova 2002. Knjiga 1: Nacionalna ili etnička pripadnost po naseljima (in Serbian). Statistical Office of the Republic of Serbia. 2003. ISBN 86-84433-00-9. Wikimedia Commons has media related to Palić. 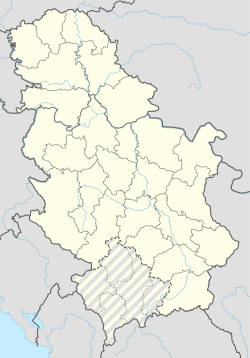 Wikivoyage has a travel guide for Palić. This page was last edited on 8 April 2019, at 11:44 (UTC).